:This watershed book by a leading Old Testament scholar presents an alternative perspective in the ongoing debate about the formation of the Hebrew Bible. It marshals all of the important counterarguments to the standard theory of Old Testament canon formation, showing how the Pentateuch and the Prophets developed more or less simultaneously and mutually influenced each other over time. The widely praised European edition is now available in North America with an updated bibliography and a new postscript reflecting on how the study of the Old Testament canon has developed over the last twenty years. 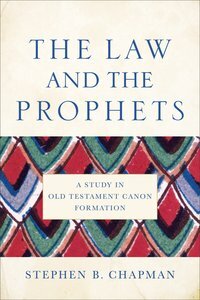 About "The Law and the Prophets: A Study in Old Testament Canon Formation"
&#9;appendices To The Prophetic Corpus? 4. The Law And . . .
&#9;a Third Layer Of Redaction? 6. The Pre-eminence Of Torah? &#9;the Place Of The Writings? Expected to ship November 2019.